Ebony Lavonne Smith, 20, who had started working with USPS in early 2015 pleaded guilty on Sept. 12 to stealing mail — and the money within — between April 1, 2017 and Jan. 25, 2018. (WAUWATOSA, Wis.) — A U.S. 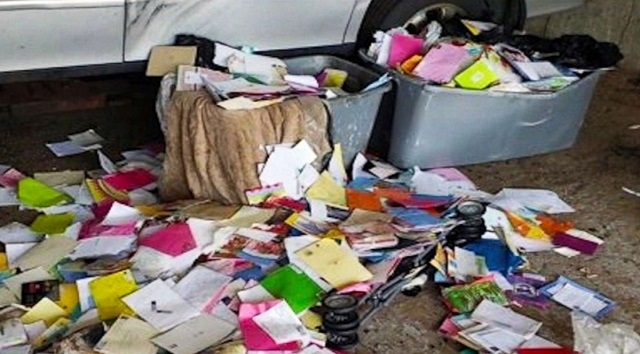 Postal worker who was recently terminated from her job has pleaded guilty to stealing cash and checks from over 6,000 greeting cards. Smith was assigned to deliver mail in Wauwatosa, Wisconsin on March 28, 2017. A few months later, in August, USPS customers in her designated ZIP codes began complaining about not receiving greeting cards in the mail, according to Smith’s plea agreement. Following an investigation where Smith was identified as the carrier who would be responsible for this mail, a USPS supervisor placed a blue envelope in a container meant for residents on Smith’s route. Within the envelope, there was a greeting card with a $20 bill inside, as well as a transmitter that would signal when the envelope was opened, the plea agreement said. While under surveillance, the USPS supervisor also observed Smith looking through trays assigned to other delivery routes, removing greeting cards from them, and then placing them in her own tray. Soon after, Smith left to deliver the mail — including the blue envelope — along her route, the agreement said. When she arrived at the address written on the blue envelope, the transmitter activated, indicating that the envelope had been opened. This is when investigating postal agents approached Smith, who was standing outside of her vehicle, and read Smith her rights. Then they located the envelope, which no longer had the $20 bill, and allowed Smith to retrieve the money from her purse. The serial number matched the one that they had planted in the blue envelope, the agreement said. Postal authorities also found 31 other greeting cards inside a USPS satchel on the passenger side floor of Smith’s USPS vehicle, as well as 23 greeting cards and a Starbucks gift card from between the front seats, according to the agreement. Additionally, they found a roll of tape and letter openers in the driver’s side door. Smith said that she began stealing the cash when she began her route in the Washington Highlands and that she would steal mail about one to two days per week in order to pay bills and take care of her four children, the agreement said. In all, she said she began stealing an estimated $40 a week from customer’s mail, but that later on she began stealing $50 to $100 a week. She also admitted to using the tape to reseal some of the greeting cards that she opened. Smith’s lawyer did not immediately respond to requests for comment from ABC News. Smith was terminated earlier this year, according to Jeff Arney, assistant special agent in charge and public information officer for the Great Lakes Area Field Office of the U.S. Postal Service Office of Inspector General. As for the cards, he told ABC News that the ones the agents found would be sent to their original recipients, and that anyone who wishes to claim something that was lost due to Smith can ask for restitution through the court process.